One of the cystoid necromutations, the Lesion is a drifting, semiliquid paraliving bioform known for its physical resilience and insatiable appetite. 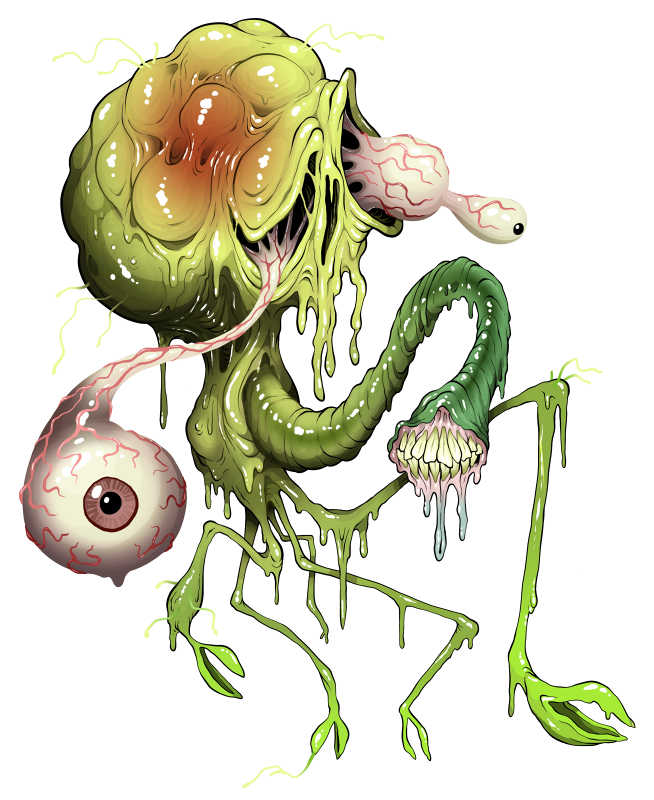 This bizarre monster begins its existence as a spontaneous parasitic teratoma in the innards of a zombie, growing and feeding until large enough to "hatch" and gnaw its way out of its "parent." The core of the creature's body is little more than a series of gas-filled tumors with a rudimentary brain, the rest of is body an amorphous matrix of symbiotic bacteria, plasma and microfilaments of living tissue - a "skin" of thick, tarry pus. While the balloon-like Lesion need never touch the ground, the monster dislikes freely floating and can propel itself only weakly through the air, sometimes finding itself at the mercy of strong winds. Instead, it keeps itself anchored by at least one appendage at a time, swiftly pulling itself along solid surfaces. While a Lesion can subsist on almost any organic matter, it particularly craves fresh brains, and may spin a web of its own pus to ensnare living prey. When several Lesion meet, they may even dig a pit and form a "glue trap" from their own mushy bodies. Lesion emit a rather pitiful selection of gasps, whimpers, sighs and brief, shuddering moans, sounding almost disgusted by their own existence. Most of these vocalizations, however, are express pure excitement as the monster catches scent of fresh food. With its soft, slimy form, it may even squeeze itself completely inside the corpse of fresh prey, wallowing in its meal with sheer delight. Like all zombie spawn, Lesion can withstand an astonishing amount of physical damage without so much as slowing down, even coordinating the movements of severed portions to incapacitate prey. Its sticky, semiliving pus boasts varied uses, functioning to some degree like the silk of an enormous spider. Coupled with its flotation - however crude - the Lesion is a versatile and dependable underling, if not very bright. ADHESION: the pus coating of a Lesion can be as sticky as tar when the monster so chooses, giving it an almost unbreakable grip. AMORPHOUS OOZE: the Lesion can manipulate its pus as an extension of its body, forming new appendages as necessary, sending disconnected fragments of its mass to attack its adversaries or spinning the substance into webs and tethers. BUOYANT GAS: a Lesion is filled with a light, foul-smelling chemical concoction allowing it to drift through the air. Venting a portion of this gas can momentarily propel the monster at high speed in a single direction. NOXIOUS: a Lesion smells and tastes extremely foul to many palates. GNASHING TRUNK: the monster's small but powerful jaws are situated on a flexible, extensible proboscis.